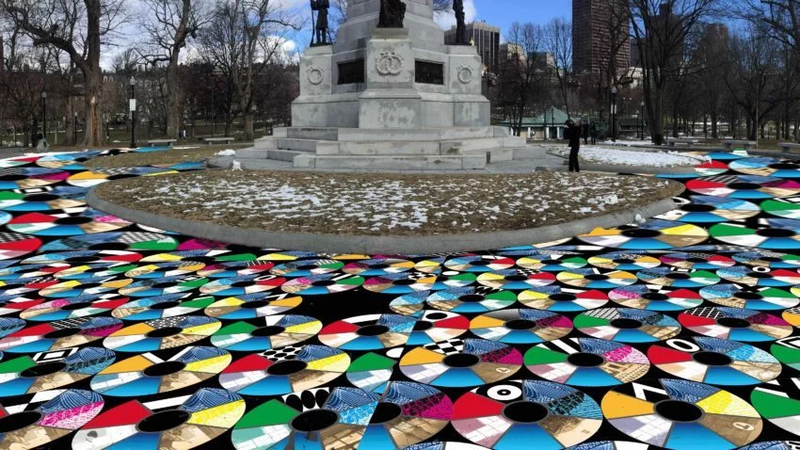 The Jewish Arts Collaborative has engaged American sculptor, Julia Vogl, to create a public piece of temporary art on the Boston Common that will be inspired by dialogue about freedom and immigration in Boston. Her artwork will reflect the 2,000 conversations she will have in the coming weeks, asking people from all backgrounds about their journeys to freedom. Drawing inspiration from these stories, Vogl will create a larger than life visual representation that will be on display to the public from on display from April 25 to May 2 on the Soldiers and Sailors Monument on Boston Common. Would you like to be involved in this public art project? Vogl is inviting the public to meet up with her at scheduled “encounters” around Greater Boston. These encounters started this week and will run through Sunday, April 8. If you decide to participate, you will be asked to answer four multiple-choice questions about freedom and immigration on an iPad and decorate a button that is fashioned after a seder plate. For more information about this project link here: Pathways to Freedom. This entry was posted in Art & Film, Free Stuff and tagged Art and Film, BosGuy, Boston, Boston Guy. Bookmark the permalink.